It is also known as the hook-nosed sea snake, the common sea snake, and the Valakadyn sea snake. The nostril in front gives a characteristic beak-like appearance. They average about 1.2 metres in length and have one of the deadliest venoms of all snakes. Just 1.5 milligrams of its venom, rated four to eight times as toxic as cobra venom, can cause death to humans but they are not known to attack humans often. 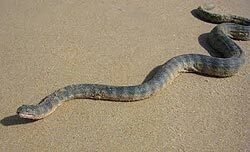 They are, however, aggressive and readily provoked, this widespread species is responsible for nine out of every ten deaths from sea-snake bites. They are found in Madagascar, the seas off South Asia (Pakistan, India and Bangladesh), Southeast Asia (Myanmar (formerly Burma), Thailand, Vietnam), and Australia (Northern Territory and Queensland) and New Guinea. 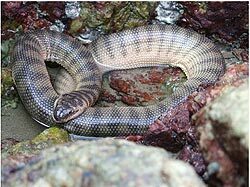 These snakes are most common around the coast and coastal islands of India. They are active by day and at night. They are able to dive up to 100 metres and stay underwater for a up to f five hours before resurfacing. Its fangs are less than 4 mm long, but its jaws can stretch widely to allow it to swallow large prey. It feeds mainly on catfish and shrimp by swimming near the bottom in shallow, murky water, in coastal waters, mangrove swamps, estuaries, and rivers. They locate their victims by smell and touch. Like other fish-eating snakes, it waits until its prey has stopped struggling, before turning it so that it can be consumed head-first. Beaked sea snakes give birth to up to 30 young each time they breed, but their death rate is high so only a small proportion of the young survive to become adults Despite their venom, these snakes are eaten by inshore predators, such as fish and estuarine crocodiles.